The OMDC-ASP10 is a compact, economical control that can be used with conventional AC, DC, or Brushless DC adjustable speed drive systems to provide an LED display of set speeds and precise, digital closed loop motor speed control. An on-board microprocessor with non-volatile memory coupled with sophisticated internal software makes the OMDC-ASP10 the ultimate in accuracy and control. Target speeds are displayed directly in RPM, FPM, GPM, process time, or any other engineering unit of measure. Friendly front-panel field programming permits customizing the controller to the exact specifications for each application; maximum and minimum set speed, decimal points or colon, operating mode (master or follower), and the constant which takes into account motor gear ratios. 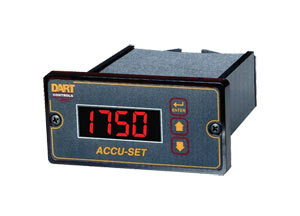 The OMDC-ASP10 is simple to operate… just set the desired RPM, rate, or time in the large ½" LED display by depressing the "up-down" pushbuttons, one digit at a time or fast sweep. The OMDC-ASP10 settings are exact and repeatable. It will precisely control speed to a remarkable ±½ RPM of set speed, long term. The panel mount unit is easy to install into a standard 1⁄8 DIN cutout. All wiring connects directly to a rugged screw type terminal strip through the easy access rear panel.